Chuck DeJonckheere (L), Hamilton County Public Health director of waste management, accepts the Ohio Environmental Health Association President’s Award from Paul DePasquale, association president. 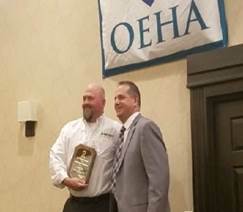 HAMILTON COUNTY, OHIO – Hamilton County Public Health director of waste management, Chuck DeJonckheere was recognized by the Ohio Environmental Health Association (OEHA) as its President’s Award winner. The award was presented at the organization’s state-wide meeting April 17. He is a resident of Montgomery. DeJonckheere directs the agency’s waste management function, which inspects and monitors solid waste disposal sites, infectious waste disposal, composting facilities, tire storage and recovery operations, lead testing and remediation, and tattoo and piercing facilities. He was recognized for his work in providing OEHA technical assistance which helped passage of Ohio Senate Bill 2, which ensures responsible disposal of construction and demolition debris. Ohio Senate Bill 2, passed in 2017, establishes guidelines for the construction and demolition debris industry, ensuring that these previously unregulated businesses manage and dispose of materials in an environmentally-friendly manner. “Chuck is an example to all of us on how a member can become involved within our association and make a strong and useful impact,” said Paul DePasquale, OEHA president. In addition, the award recognizes his contributions to the organization as chair of its Solid Waste Committee and his service on the Ohio EPA Materials Management and Advisory Committee.